A cryptograph which gives, instead of the intended word, its numerical value, or a cipher produced by the permutation of letters. The term first occurs in literature in the twenty-ninth of the thirty-two hermeneutic rules of R. Eliezer b. R. Jose, the Galilean (c. 200). In some texts the rule for permutative gemaṭria is counted as a separate regulation—the thirtieth (comp. Königsberger's edition of the rules in his "Monatsblätter für Vergangenheit und Gegenwart des Judenthums"). Waldberg ("Darke ha-Shinnuyim"), who gives a list of 147 cases of gemaṭria occurring in traditional literature, includes in this number cases of symbolical numbers, which properly belong to the twenty-seventh rule ("ke-neged"). 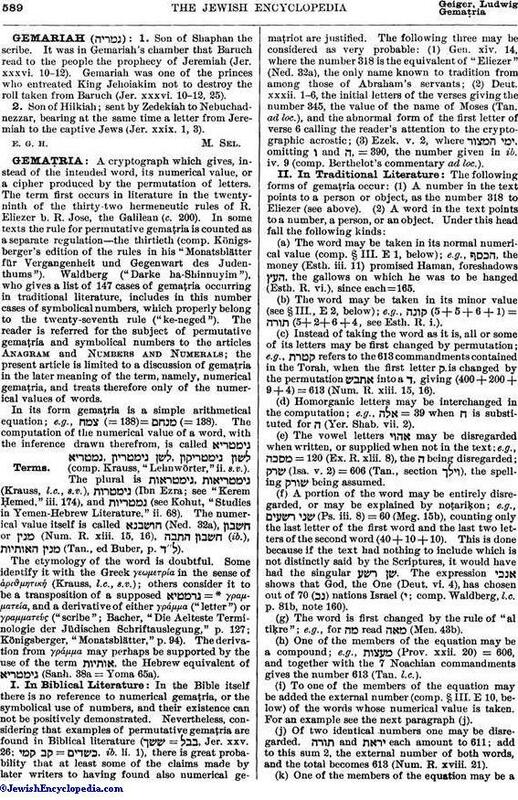 The reader is referred for the subject of permutative gemaṭria and symbolical numbers to the articles Anagram and Numbers and Numerals; the present article is limited to a discussion of gemaṭria in the later meaning of the term, namely, numerical gemaṭria, and treats therefore only of the numerical values of words. In its form gemaṭria is a simple arithmetical equation; e.g., (= 138) = (= 138). The computation of the numerical value of a word, with the inference drawn therefrom, is called (comp. Krauss, "Lehnwörter," ii. s.v.). The plural is (Krauss, l.c., s.v. ), (Ibn Ezra; see "Kerem Ḥemed," iii. 174), and (see Kohut, "Studies in Yemen-Hebrew Literature," ii. 68). The numerical value itself is called (Ned. 32a), or (Num. R. xiii. 15, 16), (ib. ), (Tan., ed Buber, p. ). The etymology of the word is doubtful. Some identify it with the Greek γεωμετρία in the sense of ἀριϑμητική (Krauss, l.c., s.v. ); others consider it to be a transposition of a supposed = * γραμματεία, and a derivative of either γράμμα ("letter") or γραμματευς ("scribe"; Bacher, "Die Aelteste Terminologie der Jüdischen Schriftauslegung," p. 127; Königsberger, "Monatsblätter," p. 94). The derivation from γράμμα may perhaps be supported by the use of the term , the Hebrew equivalent of (Sanh. 38a = Yoma 65a). In the Bible itself there is no reference to numerical gemaṭria, or the symbolical use of numbers, and their existence can not be positively demonstrated. Nevertheless, considering that examples of permutative gemaṭria are found in Biblical literature ( , Jer. xxv. 26; , ib. li. 1), there is great probability that at least some of the claims made by later writers to having found also numerical gemaṭriot are justified. The following three may be considered as very probable: (1) Gen. xiv. 14, where the number 318 is the equivalent of "Eliezer" (Ned. 32a), the only name known to tradition from among those of Abraham's servants; (2) Deut. xxxii. 1-6, the initial letters of the verses giving the number 345, the value of the name of Moses (Tan. ad loc. ), and the abnormal form of the first letter of verse 6 calling the reader's attention to the cryptographic acrostic; (3) Ezek. v. 2, where , omitting ו and ח, = 390, the number given in ib. iv. 9 (comp. Berthelot's commentary ad loc.). (a) The word may be taken in its normal numerical value (comp. § III. E 1, below); e.g., , the money (Esth. iii. 11) promised Haman, foreshadows , the gallows on which he was to be hanged (Esth. R. vi. ), since each = 165. (b) The word may be taken in its minor value (see § III., E 2, below); e.g., (5 + 5 + 6 + 1) = (5 + 2 + 6 + 4, see Esth. R. i.). (c) Instead of taking the word as it is, all or some of its letters may be first changed by permutation; e.g., to the 613 commandments contained in the Torah, when the first letter ק is changed by the permutation into a ד, giving (400 + 200 + 9 + 4) = 613 (Num. R. xiii. 15, 16). (d) Homorganic letters may be interchanged in the computation; e.g., = 39 when ח is substituted for ח (Yer. Shab. vii. 2). (e) The vowel letters may be disregarded when written, or supplied when not in the text; e.g., = 120 (Ex. R. xlii. 8), the ח being disregarded; (Isa. v. 2) = 606 (Tan., section ), the spelling being assumed. (f) A portion of the word may be entirely disregarded, or may be explained by noṭariḳon; e.g., (Ps. iii. 8) = 60 (Meg. 15b), counting only the last letter of the first word and the last two letters of the second word (40 + 10 + 10). This is done because if the text had nothing to include which is not distinctly said by the Scriptures, it would have had the singular . The expression shows that God, the One (Deut. vi. 4), has chosen out of 70 ( ) nations Israel (י; comp. Waldberg, l.c. p. 81b, note 160). (g) The word is first changed by the rule of "al tiḳre"; e.g., for read (Men. 43b). (h) One of the members of the equation may be a compound; e.g., (Prov. xxii. 20) = 606, and together with the 7 Noachian commandments gives the number 613 (Tan. l.c.). (i) To one of the members of the equation may be added the external number (comp. § III. E 10, below) of the words whose numerical value is taken. For an example see the next paragraph (j). (j) Of two identical numbers one may be disregarded. and each amount to 611; add to this sum 2, the external number of both words, and the total becomes 613 (Num. R. xviii. 21). (k) One of the members of the equation may be amultiple of the other (comp. § III. E 12, below); e.g., װ (Ex. xv. 16) refers to the twenty-six generations that passed from the creation of the world to the revelation on Sinai (Tan., section ). (l) Integration (comp. III. D e, below) may be used (comp. Waldberg, l.c. 77b, note 87, and 88a, note 90). (m) The grammatical form of the word may be interpreted in terms of numbers; e.g., (Ex. xxxv. 1) amount to 39 in the following way: = 36; the additional 3 are gained from in one of two ways. R. Jose b. Ḥanina says: is 1, is 2, is 3; R. Ḥanina of Sepphoris, in the name of R. Abahu, explains: is 1, is 2 (Yer. Shab. v. 2), is 3 (anonymously in Num. R. xviii. 21). The gemaṭria method, developed largely in the Middle Ages, became a very popular mode of interpretation, entire treatises being devoted to this branch (see Benjacob, "Oẓar ha-Sefarim," p. 96, Nos. 119, 120; 123; p. 479, No. 737). In cabalistic literature the use of gemaṭria has been greatly extended, and its forms have been developed in many directions. The principle on which gemaṭria rests is not stated in traditional literature; but it may be assumed that it is essentially the same as that which is found in the Cabala, though in the latter it has been developed along the lines of cosmogonic theories. A. Theoretic Basis: All creation has developed through emanation from the En Sof. The first degrees of that evolution are the ten Sefirot, from the last of which, Kingdom, developed the twenty-two letters of the Hebrew alphabet. Through the latter the whole finite world has come into existence. These letters are dynamic powers. Since these powers are numbers, everything that has sprung from them is number. Number is the essence of things, whose local and temporal relations ultimately depend on numerical proportions. Everything has its prototype in the world of spirit, that spiritual prototype being the germ from which the thing has been developed. As the essence of things is number, the identity of things in number demontrates their identity in essence. B. Degrees of Identity: While all of the twenty-two letters of the alphabet are coordinate powers, still it is evident that the ramifications of a letter like ד, for example, whose numerical value is 4, can not be the same as those of the letter ת, whose numerical value is 400. It is, moreover, equally apparent that two equal sums will not be absolutely identical in their contents, if the factors in each are different. The identity, therefore, implied in a gemaṭrical equation admits of a practically unlimited number of degrees. It is only for the highest three degrees that the cabalists have coined the following terms:(a) ("degree of equibalance"), the highest degree, which denotes an equation with an equal number of letters in both members; e.g., (40 + 5 + 200 + 2 + 1) = (30 + 1 + 10 + 7 + 200) = 248; each member having 5 letters. 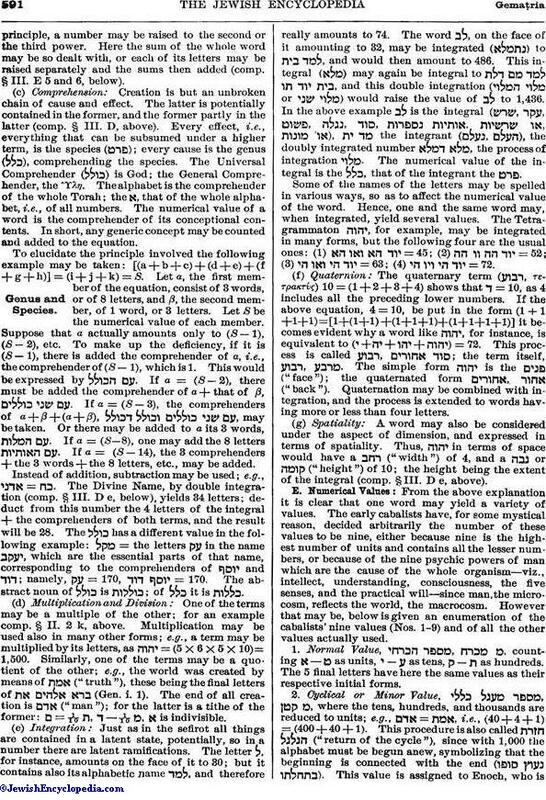 (b) or ("degree of addition," or "degree of consolidation"); e.g., when , it is necessary to add the ײ and obtain a ב—both having the value of 20—to make the equation identical. (c) or ("degree of separation," or "degree of division"), when one letter is resolved into smaller values, the reverse of the preceding. 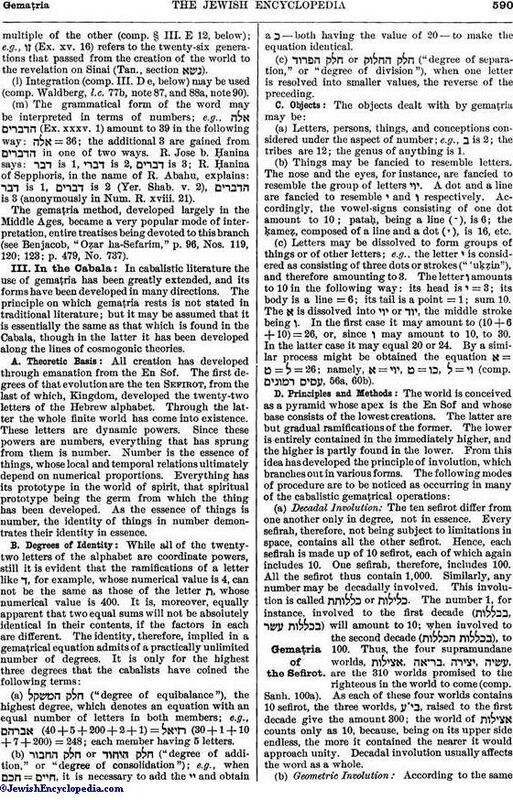 C. Objects: The objects dealt with by gemaṭria may be:(a) Letters, persons, things, and conceptions considered under the aspect of number; e.g., ב is 2; the tribes are 12; the genus of anything is 1. (b) Things may be fancied to resemble letters. The nose and the eyes, for instance, are fancied to resemble the group of letters . A dot and a line are fancied to resemble י and ו respectively. Accordingly, the vowel-signs consisting of one dot amount to 10; pataḥ, being a line ( ), is 6; the ḳameẓ, composed of a line and a dot ( ), is 16, etc. (c) Letters may be dissolved to form groups of things or of other letters; e.g., the letter י is considered as consisting of three dots or strokes ("'uḳẓin"), and therefore amounting to 3. The letter ו amounts to 10 in the following way: its head is י = 3; its body is a line = 6; its tail is a point = 1; sum 10. The א is dissolved into or , the middle stroke being ו. In the first case it may amount to (10 + 6 + 10) = 26, or, since ו may amount to 10, to 30. In the latter case it may equal 20 or 24. By a similar process might be obtained the equation א = ט = ל = 26; namely, ,(comp. , 56a, 60b). (a) Decadal Involution: The ten sefirot differ from one another only in degree, not in essence. Every sefirah, therefore, not being subject to limitations in space, contains all the other sefirot. Hence, each sefirah is made up of 10 sefirot, each of which again includes 10. One sefirah, therefore, includes 100. All the sefirot thus contain 1,000. Similarly, any number may be decadally involved. This involution is called or . The number 1, for instance, involved to the first decade ( , ) will amount to 10; when involved to the second decade ( ), to 100. Thus, the four supramundane worlds, , are the 310 worlds promised to the righteous in the world to come (comp. Sanh. 100a). As each of these four worlds contains 10 sefirot, the three worlds, , raised to the first decade give the amount 300; the world of counts only as 10, because, being on its upper side endless, the more it contained the nearer it would approach unity. Decadal involution usually affects the word as a whole. (b) Geometric Involution: According to the sameprinciple, a number may be raised to the second or the third power. Here the sum of the whole word may be so dealt with, or each of its letters may be raised separately and the sums then added (comp. § III. E 5 and 6, below). (c) Comprehension: Creation is but an unbroken chain of cause and effect. The latter is potentially contained in the former, and the former partly in the latter (comp. § III. D, above). Every effect, i.e., everything that can be subsumed under a higher term, is the species ( ); every cause is the genus ( ), comprehending the species. The Universal Comprehender ( ) is God; the General Comprehender, the γλη. The alphabet is the comprehender of the whole Torah; the א, that of the whole alphabet, i.e., of all numbers. The numerical value of a word is the comprehender of its conceptional contents. In short, any generic concept may be counted and added to the equation. To elucidate the principle involved the following example may be taken: [(a+b+c)+(d+e)+(f+g+h)] =(i+j+k) = S. Let α, the first member of the equation, consist of 3 words, or of 8 letters, and β, the second member, of 1 word, or 3 letters. Let S be the numerical value of each member. Suppose that α actually amounts only to (S - 1), (S - 2), etc. To make up the deficiency, if it is (S - 1), there is added the comprehender of α, i.e., the comprehender of (S - 1), which is 1. This would be expressed by . If α = (S - 2), there must be added the comprehender of α+ that of β, . If α = (S - 3), the comprehenders of α + β + (α + β), , may be taken. Or there may be added to α its 3 words, . If α = (S - 8), one may add the 8 letters . If α = (S - 14), the 3 comprehenders + the 3 words + the 8 letters, etc., may be added. Instead of addition, subtraction may be used; e.g., . The Divine Name, by double integration (comp. § III. D e, below), yields 34 letters; deduct from this number the 4 letters of the integral + the comprehenders of both terms, and the result will be 28. The has a different value in the following example: = the letters in the name , which are the essential parts of that name, corresponding to the comprehenders of and ; namely, = 170, = 170. The abstract noun of is ; of it is . (d) Multiplication and Division: One of the terms may be a multiple of the other; for an example comp. § II. 2 k, above. Multiplication may be used also in many other forms; e.g., a term may be multiplied by its letters, as = (5 X 6 X, 5 X 10) = 1,500. Similarly, one of the terms may be a quotient of the other; e.g., the world was created by means of ("truth"), these being the final letters of (Gen. i. 1). The end of all creation is ("man"); for the latter is a tithe of the former: ם = 1/10 ת, ר-1/10 ם, א is indivisible. (e) Integration: Just as in the sefirot all things are contained in a latent state, potentially, so in a number there are latent ramifications. The letter ל, for instance, amounts on the face of it to 30; but it contains also its alphabetic name , and therefore really amounts to 74. The word , on the face of it amounting to 32, may be integrated ( ) to , and would then amount to 486. This integral ( ) may again be integral to , and this double integration ( or ) would raise the value of to 1,436. In the above example is the integral ( , , the integrant ( ), the doubly integrated number , the process of integration . The numerical value of the integral is the , that of the integrant the .Some of the names of the letters may be spelled in various ways, so as to affect the numerical value of the word. Hence, one and the same word may, when integrated, yield several values. The Tetragrammaton , for example, may be integrated in many forms, but the following four are the usual ones: (1) = 45; (2) = 52; (3) = 63; (4) = 72. (f) Quaternion: The quaternary term ( , τετρακτύς) 10 = (1+2+3+4) shows that ר = 10, as 4 includes all the preceding lower numbers. If the above equation, 4 = 10, be put in the form (1+1 +1+1) = [1+ (1+1) + (1+1+1) + (1+1+1+1)] it becomes evident why a word like , for instance, is equivalent to ( ) = 72. This process is called ; the term itself, . The simple form is the ("face"); the quaternated form ("back"). Quaternation may be combined with integration, and the process is extended to words having more or less than four letters. (g) Spatiality: A word may also be considered under the aspect of dimension, and expressed in terms of spatiality. Thus, in terms of space would have a ("width") of 4, and a or ("height") of 10; the height being the extent of the integral (comp. § III. D e, above). E. Numerical Values: From the above explanation it is clear that one word may yield a variety of values. The early cabalists have, for some mystical reason, decided arbitrarily the number of these values to be nine, either because nine is the highest number of units and contains all the lesser numbers, or because of the nine psychic powers of man which are the cause of the whole organism—viz., intellect, understanding, consciousness, the five senses, and the practical will—since man, the microcosm, reflects the world, the macrocosm. However that may be, below is given an enumeration of the cabalists' nine values (Nos. 1-9) and of all the other values actually used.1. Normal Value, , counting א—ט as units, א—ע as tens, ק—ת as hundreds. The 5 final letters have here the same values as their respective initial forms.2. Cyclical or Minor Value, , , where the tens, hundreds, and thousands are reduced to units; e.g., , i.e., (40+4+1) = (400+40+1). This procedure is also called ("return of the cycle"), since with 1,000 the alphabet must be begun anew, symbolizing that the beginning is connected with the end ( ). This value is assigned to Enoch, who isidentified with Mattatron (a differentiation of Metatron), who, like the gnostic demiurge, has neither knowledge of nor understanding for involution, the pneumatic nature of things.3. Inclusive Value, , a development of the quaternion, where each number includes all the other numbers that precede it in the order of the alphabet; e.g., ה = (5+4+3+2+1) = 15; ב = (20 +10+9+8+7+6+5+4+3+2+1) = 75.4. Additory Value, , when the external number of words or of letters is added (comp. § III. D c, above).5. Square Value of the Word, . The numerical value of the word is successively multiplied by the value of each letter, and the products are added; e.g., = [(14 X 4) + (14 X 6) + (14 X 4)] = 196, or, in short, 142. The reason for such a procedure is that inasmuch as 14 branches are contained in 3 powers, each power must be contained in the other two.6. Square Value of the Letter, ; e.g., = (42+62+42) = 68.7. Nominal Value, , taking the alphabetical name of the letter for the letter itself (comp. § III. D e, above).8. Numeral Value, , substituting the numeral noun for the number; e.g., = (40+10+300+30+300+5+1+ 40+40+10+70+2+200+1)=1,049. The principle is the same as in the preceding.9. Major Numeral Value, , the preceding combined with integration; e.g., י = = = 620.10. External Value, , when the con tents are disregarded, every letter counting for 1. The Tetragrammaton can not be taken in this value ("Asis Rimmonim," 36b).11. Major Value, . In this value the final letters count as hundreds ( ). In contradistinction to the minor or cyclical value (see § III. E 2, above), the values 10—400 (see § III. E 1, above) also belong under this head.12. Multiple Value, (comp. § III. D d).13. Quotient Value, (comp. § III. D d).14. Cube Value of the Word, , .15. Cube Value of the Letter, (comp. "Ḥayyaṭ," in "Minḥat Yehudi," iii.).16. First Decadic Involution Value, (comp. § III. D a, above).17. Second Decadic Involution Value, .18. Double Integration Value, .19. Permutation Value, , when the values of the permutated letters are taken (comp. § II. 2 c, above).20-22. Quaternion Values, , either of the simple word or of the singly and doubly integrated forms (comp. § III. D f, above).Considering that the procedures and values explained above may be used in various combinations, it will easily be seen that a word may be made to yield an almost unlimited number of values. 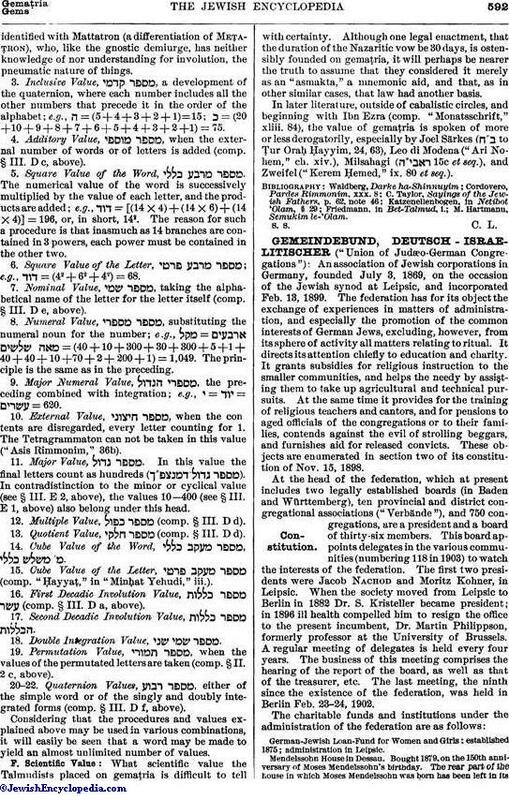 F. Scientific Value: What scientific value the Talmudists placed on gemaṭria is difficult to tell with certainty. Although one legal enactment, that the duration of the Nazaritic vow be 30 days, is ostensibly founded on gemaṭria, it will perhaps be nearer the truth to assume that they considered it merely as an "asmakta," a mnemonic aid, and that, as in other similar cases, that law had another basis.In later literature, outside of cabalistic circles, and beginning with Ibn Ezra (comp. "Monatsschrift," xliii. 84), the value of gemaṭria is spoken of more or less derogatorily, especially by Joel Särkes ( to Ṭur Oraḥ Ḥayyim, 24, 63), Leo di Modena ("Ari Nohem," ch. xiv. ), Milsahagi ( 15c et seq. ), and Zweifel ("Kerem Ḥemed," ix. 80 et seq. ).